Attention all Middle School boys, in Grades 6 – 8: are you open to discerning a vocation to the priesthood? Would you like to visit the seminary campus here in Denver? Join us for prayer, mass, and brotherhood at St. John Vianney Seminary. 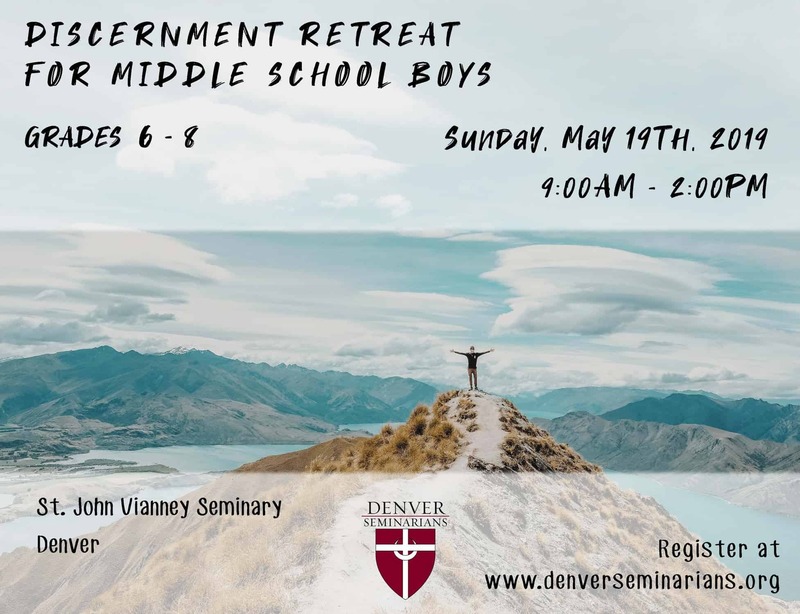 The next Middle School Boys’ Retreat is Sunday, May 19th, 2019. All boys in Grades 6 – 8 are welcome to join us for this retreat. The day’s events include Mass, a tour of the seminary campus, lunch, and a Q & A session with Fr. Ryan O’Neill, the Vocations Director. Parents are also encouraged to attend the retreat with their sons. This event is free for all attendees, so tell your friends! If interested in attending (whether or not your parents can come with you), please fill out the registration form below. Would you like to be notified about future events?